This document covers all methods that are implemented in the Python wrapper. There are many more functions and objects available via the PyObjC bridge. For more details, please have a look at the Core part of the documentation. These changes could possibly break your code, so you need to keep track of them. Please see GSApplication.versionNumber for how to check for the app version in your code. Really, read it. There’s a catch. The GSLayer the component is pointing to. This is read-only. In order to change the referenced base glyph, set GSComponent.componentName to the new glyph name. For Smart Components, the componentLayer contains the interpolated result. We’ve created a distinct .bezierPath attribute for various objects (paths, components, etc.) to use to draw in plug-ins, over-writing the previous (and never documented) .bezierPath() method (from the Python-ObjC-bridge) by the same name that handed down an NSBezierPath object. We’ve created a distinct .selection attribute for the layer object that contains all items (paths, components etc. selected by the user in the UI), overwriting the previous .selection() method (from the PyObjC bridge). The mothership. Everything starts here. The active GSFont object or None. font.familyName = "My New Fonts"
List of available reporter plug-ins (same as bottom section in the ‘View’ menu). These are the actual objects. You can get hold of their names using object.__class__.__name__ . Also see GSApplication.activateReporter() and GSApplication.deactivateReporter() methods below to activate/deactivate them. List of activated reporter plug-ins. List of available filters (same as ‘Filter’ menu). These are the actual objects. Below sample code shows how to get hold of a particular filter and use it. You invoke it using the processFont_withArguments_() function for old plugins, or the filter() function for newer plugins. As arguments you use the list obtained by clicking on ‘Copy Custom Parameter’ button in the filter’s dialog (gear icon) and convert it to a list. In the include option you can supply a comma-separated list of glyph names. Here’s a catch: old plugins will only run on the first layer of a glyph, because the function processFont_withArguments_() was designed to run on instances upon export that have already been reduced to one layer. You can work around that by changing the order of the layers, then changing them back (not shown in the sample code). A dict like object for storing preferences. You can get and set key-value pairs. Please be careful with your keys. Use a prefix that uses the reverse domain name. e.g. “com.MyName.foo.bar”. A list of dictionaries with more detailed language informations. Width of glyph Edit view. Corresponds to the “Width of editor” setting from the Preferences. Size of Bezier handles in Glyph Edit view. Possible value are 0–2. Corresponds to the “Handle size” setting from the Preferences. To use the handle size for drawing in reporter plugins, you need to convert the handle size to a point size, and divide by the view’s scale factor. See example below. String containing Glyph.app’s version number. May contain letters also, like ‘2.3b’. To check for a specific version, use .versionNumber below. Glyph.app’s version number. Use this to check for version in your code. Here’s the catch: Since we only added this versionNumber attribute in Glyphs v2.3, it is not possible to use this attribute to check for versions of Glyphs older than 2.3. We’re deeply sorry for this inconvenience. Development is a slow and painful process. Especially if you’re using preview builds, this number may be more important to you than the version number. The build number increases with every released build and is the most significant evidence of new Glyphs versions, while the version number is set arbitrarily and stays the same until the next stable release. Add menu items to Glyphs’ main menus. Path (str) – The path where the document is located. The opened document object or None. Generates GSGlyphInfo object for a given glyph name. font – if you add a font, and the font has a local glyph info, it will be used instead of the global info data. Generates GSGlyphInfo object for a given hex unicode. If defined as a ligature in the glyph database, this function returns a list of glyph names that this ligature could be composed of. Add a user-defined function to the glyph window’s drawing operations, in the foreground and background for the active glyph as well as in the inactive glyphs. The function names are used to add/remove the functions to the hooks, so make sure to use unique function names. Your function needs to accept two values: layer which will contain the respective GSLayer object of the layer we’re dealing with and info which is a dictionary and contains the value Scale (for the moment). For the hooks these constants are defined: DRAWFOREGROUND , DRAWBACKGROUND , DRAWINACTIVE , DOCUMENTWASSAVED , DOCUMENTOPENED , TABDIDOPEN , TABWILLCLOSE , UPDATEINTERFACE , MOUSEMOVED . For more information check the constants section. Remove the function you’ve previously added. Redraws all Edit views and Preview views. Shows the user a notification in Mac’s Notification Center. Return a string in the language of Glyphs.app’s UI locale, which must be supplied as a dictionary using language codes as keys. The argument is a dictionary in the languageCode: translatedString format. You don’t need to supply strings in all languages that the Glyphs.app UI supports. A subset will do. Just make sure that you add at least an English string to default to next to all your other translated strings. Also don’t forget to mark strings as unicode strings ( u’öäüß’ ) when they contain non-ASCII content for proper encoding, and add a # encoding: utf-8 to the top of all your .py files. Tip: You can find Glyphs’ localized languages here Glyphs.defaults[“AppleLanguages”] . Activate a reporter plug-in by its object (see Glyphs.reporters) or class name. Deactivate a reporter plug-in by its object (see Glyphs.reporters) or class name. Implementation of the font object. This object is host to the masters used for interpolation. Even when no interpolation is involved, for the sake of object model consistency there will still be one master and one instance representing a single font. Also, the glyphs are attached to the Font object right here, not one level down to the masters. 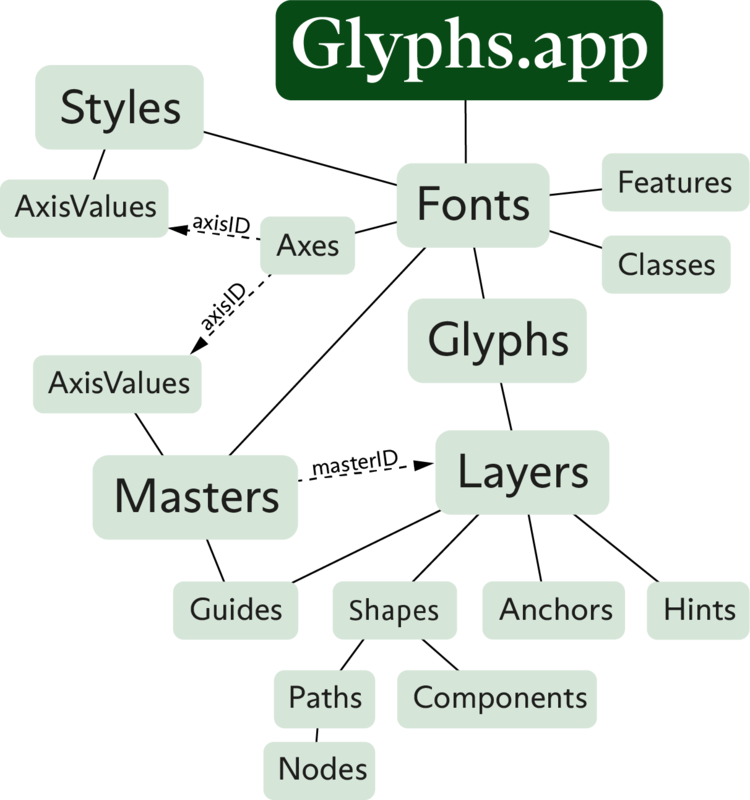 The different masters’ glyphs are available as layers attached to the glyph objects which are attached here. Returns the internal NSDocument document. Read-only. Collection of GSGlyph objects. Returns a list, but you may also call glyphs using index or glyph name or character (as of v2.4) as key. Collection of GSClass objects, representing OpenType glyph classes. Collection of GSFeature objects, representing OpenType features. Collection of GSFeaturePrefix objects, containing stuff that needs to be outside of the OpenType features. Family name of the typeface. A multi-level dictionary. The first level’s key is the GSFontMaster.id (each master has its own kerning), the second level’s key is the GSGlyph.id or class id (@MMK_L_XX) of the first glyph, the third level’s key is a glyph id or class id (@MMK_R_XX) for the second glyph. The values are the actual kerning values. To set a value, it is better to use the method GSFont.setKerningForPair(). This ensures a better data integrity (and is faster). A dictionary to store user data. Use a unique key and only use objects that can be stored in a property list (string, list, dict, numbers, NSData) otherwise the data will not be recoverable from the saved file. Corresponds to the “Don’t use nice names” setting from the Font Info dialog. The custom parameters. List of GSCustomParameter objects. You can access them by name or by index. Corresponds to the “Grid spacing” setting from the Info dialog. Corresponds to the “Grid sub divisions” setting from the Info dialog. Ready calculated size of grid for rounding purposes. Result of division of grid with gridSubDivisions. Returns a list of all selected glyphs in the Font View. Returns a list of all selected layers in the active tab. If a glyph is being edited, it will be the only glyph returned in this list. Otherwise the list will contain all glyphs selected with the Text tool. Returns the active master (selected in the toolbar). Returns the index of the active master (selected in the toolbar). The text of the current Edit view. Unencoded and none ASCII glyphs will use a slash and the glyph name. (e.g: /a.sc). Setting unicode strings works. List of open Edit view tabs in UI, as list of GSEditViewController objects. On-disk location of GSFont object. Name of tool selected in toolbar. For available names including third-party plug-ins that come in the form of selectable tools, see GSFont.tools below. Prints a list of available tool names, including third-party plug-ins. Saves the font. if no path is given, it saves to the existing location. Disables interface updates and thus speeds up glyph processing. Call this before you do big changes to the font, or to its glyphs. Make sure that you call Font.enableUpdateInterface() when you are done. This re-enables the interface update. Only makes sense to call if you have disabled it earlier. Makes font visible in the application, either by bringing an already open font window to the front or by appending a formerly invisible font object (such as the result of a copy() operation) as a window to the application. This returns the kerning value for the two specified glyphs (leftKey or rightKey is the glyph name) or a kerning group key (@MMK_X_XX). direction (str) – optional writing direction (see Constants). Default is LTR. # in the same font, kerning between T and A would be zero, because they use group kerning instead. This sets the kerning for the two specified glyphs (leftKey or rightKey is the glyphname) or a kerning group key (@MMK_X_XX). Removes the kerning for the two specified glyphs (LeftKey or RightKey is the glyphname) or a kerning group key (@MMK_X_XX). Updates all OpenType features and classes at once, including generating necessary new features and classes. Equivalent to the “Update” button in the features panel. This already includes the compilation of the features (see compileFeatures() ). Compiles the features, thus making the new feature code functionally available in the editor. Equivalent to the “Test” button in the features panel. Implementation of the master object. This corresponds with the “Masters” pane in the Font Info. In Glyphs.app, the glyphs of each master are reachable not here, but as layers attached to the glyphs attached to the font object. See the infographic on top for better understanding. Reference to the GSFont object that contains the master. Normally that is set by the app, only if the instance is not actually added to the font, then set this manually. The human-readable identification of the master, e.g., “Bold Condensed”. Human-readable weight name, chosen from list in Font Info. For the position in the interpolation design space, use axes. Deprecated since version 2.5.2: Use GSFontMaster.name instead. Human-readable width name, chosen from list in Font Info. For the position in the interpolation design space, use axes. The name of the custom interpolation dimension. Deprecated since version 2.5.2: Use GSFontMaster.axes instead. Value for interpolation in design space. The vertical stems. This is a list of numbers. For the time being, this can be set only as an entire list at once. The horizontal stems. This is a list of numbers. For the time being, this can be set only as an entire list at once. PS hinting Blue Values calculated from the master’s alignment zones. Read-only. PS hinting Other Blues calculated from the master’s alignment zones. Read-only. A dictionary to store user data. Use a unique key, and only use objects that can be stored in a property list (bool, string, list, dict, numbers, NSData), otherwise the data will not be recoverable from the saved file. Implementation of the alignmentZone object. There is no distinction between Blue Zones and Other Zones. All negative zones (except the one with position 0) will be exported as Other Zones. The zone for the baseline should have position 0 (zero) and a negative width. Implementation of the instance object. This corresponds with the “Instances” pane in the Font Info. Name of instance. Corresponds to the “Style Name” field in the font info. This is used for naming the exported fonts. Human-readable weight name, chosen from list in Font Info. For actual position in interpolation design space, use GSInstance.weightValue. Human-readable width name, chosen from list in Font Info. For actual position in interpolation design space, use GSInstance.widthValue. Deprecated since version 2.5.2: Use axes instead. windowsStyle This is computed from “isBold” and “isItalic”. Read-only. Reference to the GSFont object that contains the instance. Normally that is set by the app, only if the instance is not actually added to the font, then set this manually. A dict that contains the interpolation coefficients for each master. This is automatically updated if you change interpolationWeight, interpolationWidth, interpolationCustom. It contains FontMaster IDs as keys and coefficients for that master as values. Or, you can set it manually if you set manualInterpolation to True. There is no UI for this, so you need to do that with a script. Disables automatic calculation of instanceInterpolations This allowes manual setting of instanceInterpolations. a proxy font that acts similar to a normal font object but only interpolates the glyphs you ask it for. It is not properly wrapped yet. So you need to use the ObjectiveC methods directly. Returns a ready interpolated GSFont object representing this instance. Other than the source object, this interpolated font will contain only one master and one instance. Note: When accessing several properties of such an instance consecutively, it is advisable to create the instance once into a variable and then use that. Otherwise, the instance object will be completely interpolated upon each access. See sample below. Exports the instance. All parameters are optional. On success, True, on failure error message. Implementation of the Custom Parameter object. It stores a name/value pair. Implementation of the class object. It is used to store OpenType classes. code Utilities needed to emulate Python’s interactive interpreter. A string with space separated glyph names. Define whether this class should be auto-generated when pressing the ‘Update’ button in the Font Info. Implementation of the featurePrefix object. It is used to store things that need to be outside of a feature like standalone lookups. A String containing feature code. Define whether this should be auto-generated when pressing the ‘Update’ button in the Font Info. Implementation of the feature object. It is used to implement OpenType Features in the Font Info. The Feature code in Adobe FDK syntax. Define whether this feature should be auto-generated when pressing the ‘Update’ button in the Font Info. Calls the automatic feature code generator for this feature. You can use this to update all OpenType features before export. Implementation of the glyph object. string A collection of string constants. Reference to the GSFont object. String with the hex Unicode value of glyph, if encoded. List of String‚ with the hex Unicode values of glyph, if encoded. String representation of glyph, if encoded. This is similar to the string representation that you get when copying glyphs into the clipboard. The category of the glyph. e.g. ‘Letter’, ‘Symbol’ Setting only works if storeCategory is set (see below). Set to True in order to manipulate the category of the glyph (see above). Makes it possible to ship custom glyph data inside a .glyphs file without a separate GlyphData file. Same as Cmd-Alt-i dialog in UI. The subCategory of the glyph. e.g. ‘Uppercase’, ‘Math’ Setting only works if storeSubCategory is set (see below). Set to True in order to manipulate the subCategory of the glyph (see above). Makes it possible to ship custom glyph data inside a .glyphs file without a separate GlyphData file. Same as Cmd-Alt-i dialog in UI. The script of the glyph, e.g., ‘latin’, ‘arabic’. Setting only works if storeScript is set (see below). Set to True in order to manipulate the script of the glyph (see above). Makes it possible to ship custom glyph data inside a .glyphs file without a separate GlyphData file. Same as Cmd-Alt-i dialog in UI. The productionName of the glyph. Setting only works if storeProductionName is set (see below). Set to True in order to manipulate the productionName of the glyph (see above). Makes it possible to ship custom glyph data inside a .glyphs file without a separate GlyphData file. Same as Cmd-Alt-i dialog in UI. GSGlyphInfo object for this glyph with detailed information. The leftKerningGroup of the glyph. All glyphs with the same text in the kerning group end up in the same kerning class. The rightKerningGroup of the glyph. All glyphs with the same text in the kerning group end up in the same kerning class. The key to be used with the kerning functions (GSFont.kerningForPair(), GSFont.setKerningForPair()GSFont.removeKerningForPair()). If the glyph has a :att:`leftKerningGroup <GSGlyph.leftKerningGroup>` attribute, the internally used @MMK_R_xx notation will be returned (note that the R in there stands for the right side of the kerning pair for LTR fonts, which corresponds to the left kerning group of the glyph). If no group is given, the glyph’s name will be returned. # For LTR fonts, always use the .rightKerningKey for the first (left) glyph of the pair, .leftKerningKey for the second (right) glyph. If the glyph has a :att:`rightKerningGroup <GSGlyph.rightKerningGroup>` attribute, the internally used @MMK_L_xx notation will be returned (note that the L in there stands for the left side of the kerning pair for LTR fonts, which corresponds to the right kerning group of the glyph). If no group is given, the glyph’s name will be returned. The leftMetricsKey of the glyph. This is a reference to another glyph by name or formula. It is used to synchronize the metrics with the linked glyph. The rightMetricsKey of the glyph. This is a reference to another glyph by name or formula. It is used to synchronize the metrics with the linked glyph. The widthMetricsKey of the glyph. This is a reference to another glyph by name or formula. It is used to synchronize the metrics with the linked glyph. NSColor object of glyph color, useful for drawing in plugins. # set the glyph color. Return True if the Glyph is selected in the Font View. This is different to the property font.selectedLayers which returns the selection from the active tab. A list of GSSmartComponentAxis objects. These are the axis definitions for the interpolations that take place within the Smart Components. Corresponds to the ‘Properties’ tab of the glyph’s ‘Show Smart Glyph Settings’ dialog. Also see https://glyphsapp.com/tutorials/smart-components for reference. Change date when glyph was last changed as datetime. Check Python’s time module for how to use the timestamp. Call this before you do a longer running change to the glyph. Be extra careful to call Glyph.endUndo() when you are finished. This closes a undo group that was opened by a previous call of Glyph.beginUndo(). Make sure that you call this for each beginUndo() call. Updates all information like name, unicode etc. for this glyph. Duplicate the glyph under a new name and return it. If no name is given, .00n will be appended to it. Implementation of the layer object. Reference to the glyph object that this layer is attached to. Master that this layer is connected to. Read only. The ID of the fontMaster this layer belongs to, in case this isn’t a master layer. Every layer that isn’t a master layer needs to be attached to one master layer. The unique layer ID is used to access the layer in the glyphs layer dictionary. NSColor object of layer color, useful for drawing in plugins. # set the layer color. List of all selected objects in the glyph. Read-only. This list contains all selected items, including nodes, anchors, guidelines etc. If you want to work specifically with nodes, for instance, you may want to cycle through the nodes (or anchors etc.) and check whether they are selected. See example below. The leftMetricsKey of the layer. This is a reference to another glyph by name or formula. It is used to synchronize the metrics with the linked glyph. The rightMetricsKey of the layer. This is a reference to another glyph by name or formula. It is used to synchronize the metrics with the linked glyph. The widthMetricsKey of the layer. This is a reference to another glyph by name or formula. It is used to synchronize the metrics with the linked glyph. Bounding box of whole glyph as NSRect. Read-only. Bounding box of the layer’s selection (nodes, anchors, components etc). Read-only. The background image. It will be scaled so that 1 em unit equals 1 of the image’s pixels. The layer as an NSBezierPath object. Useful for drawing glyphs in plug-ins. All open paths of the layer as an NSBezierPath object. Useful for drawing glyphs as outlines in plug-ins. The layer as an NSBezierPath object including paths from components. Useful for drawing glyphs in plug-ins. All open paths of the layer as an NSBezierPath object including paths from components. Useful for drawing glyphs as outlines in plugins. Indicates if the components are auto aligned. Maps this layer to the poles on the interpolation axes of the Smart Glyph. The dictionary keys are the names of the GSSmartComponentAxis objects. The values are 1 for bottom pole and 2 for top pole. Corresponds to the ‘Layers’ tab of the glyph’s ‘Show Smart Glyph Settings’ dialog. Decomposes all components of the layer at once. Decomposes all corners of the layer at once. Returns a string representing the outline structure of the glyph, for compatibility comparison. Closes all open paths when end points are further than 1 unit away from each other. Returns a copy of the layer with all components decomposed. Take over LSB and RSB from linked glyph. Round the positions of all coordinates to the grid (size of which is set in the Font Info). Add nodes at layer’s extrema, e.g., top, bottom etc. Apply a transformation matrix to the layer. Call this before you do bigger changes to the Layer. This will increase performance and prevent undo problems. Always call layer.endChanges() if you are finished. Call this if you have called layer.beginChanges before. Make sure to group bot calls properly. Return all intersection points between a measurement line and the paths in the layer. This is basically identical to the measurement tool in the UI. Normally, the first returned point is the starting point, the last returned point is the end point. Thus, the second point is the first intersection, the second last point is the last intersection. Adds missing anchors defined in the glyph database. Unselect all selected items in this layer. Remove all elements from layer. Swap Foreground layer with Background layer. Re-interpolate a layer according the other layers and its interpolation values. Applies to both master layers as well as brace layers and is equivalent to the ‘Re-Interpolate’ command from the Layers palette. Implementation of the anchor object. Selection state of anchor in UI. The Position of the component. A scale factor of 1.0 (100%) means that 1 em unit equals 1 of the image’s pixels. This sets the scale factor for x and y scale simultaneously. For separate scale factors, please use the transformation matrix. The glyph name the component is pointing to. The GSGlyph the component is pointing to. This is read-only. In order to change the referenced base glyph, set componentName to the new glyph name. The GSLayer the component is pointing to. This is read-only. In order to change the referenced base glyph, set componentName to the new glyph name. For Smart Components, the componentLayer contains the interpolated result. Transformation matrix of the component. Defines whether the component is automatically aligned. Selection state of component in UI. Dictionary of interpolations values of the Smart Component. Key are the names, values are between the top and the bottom value of the corresponding GSSmartComponentAxis objects. Corresponds to the values of the ‘Smart Component Settings’ dialog. Returns None if the component is not a Smart Component. The component as an NSBezierPath object. Useful for drawing glyphs in plugins. Apply a transformation matrix to the component. Name of the axis. The name is for display purpose only. Top end (pole) value on interpolation axis. Bottom end (pole) value on interpolation axis. Implementation of the path object. If you build a path in code, make sure that the structure is valid. A curve node has to be preceded by two off-curve nodes. And an open path has to start with a line node. Reference to the layer object. A list of segments as NSPoint objects. Two objects represent a line, four represent a curve. Start point of the segment is included. Path direction. -1 for counter clockwise, 1 for clockwise. Selection state of path in UI. The same path as an NSBezierPath object. Useful for drawing glyphs in plugins. Add nodes at path’s extrema, e.g., top, bottom etc. Apply a transformation matrix to the path. Implementation of the node object. pt – The position of the node. Always compare against the constants, never against the actual value. Deprecated since version 2.3: Use smooth instead. Selection state of node in UI. Returns the index of the node in the containing path or maxint if it is not in a path. Returns the next node in the path. Please note that this is regardless of the position of the node in the path and will jump across the path border to the beginning of the path if the current node is the last. If you need to take into consideration the position of the node in the path, use the node’s index attribute and check it against the path length. Returns the previous node in the path. Please note that this is regardless of the position of the node in the path, and will jump across the path border to the end of the path if the current node is the first. Attaches a name to a node. Turn this node into the start point of the path. Toggle between sharp and smooth connections. Implementation of the guide object. Selection state of guideline in UI. Implementation of the annotation object. The position of the annotation. The angle of the annotation. The width of the annotation. Implementation of the hint object. The first node the hint is attached to. The the second node this hint is attached to. In the case of a ghost hint, this value will be empty. A third node this hint is attached to. Used for Interpolation or Diagonal hints. A fourth node this hint is attached to. Used for Diagonal hints. See Constants section at the bottom of the page. Stores extra options for the hint. For TT hints, that might be the rounding settings. See Constants section at the bottom of the page. True if hint is horizontal, False if vertical. Selection state of hint in UI. Name of the hint. This is the referenced glyph for corner and cap components. Index of TrueType stem that this hint is attached to. The stems are defined in the custom parameter “TTFStems” per master. For no stem, value is -1. For automatic, value is -2. Crop rectangle. This is relative to the image size in pixels, not the font’s em units (just in case the image is scaled to something other than 100%). Defines whether image is locked for access in UI. Defines the transparence of the image in the Edit view. Default is 50%, possible values are 10–100. To reset it to default, set it to anything other than the allowed values. Position of image in font units. A scale factor of 1.0 (100%) means that 1 font unit is equal to 1 point. Set the scale factor for x and y scale simultaneously with an integer or a float value. For separate scale factors, please use a tuple. Resets the cropping to the image’s original dimensions. Scale the image’s cropped width to a certain em unit value, retaining its aspect ratio. Scale the image’s cropped height to a certain em unit value, retaining its aspect ratio. Implementation of the GSEditViewController object, which represents Edit tabs in the UI. The GSFont object that this tab belongs to. The text of the tab, either as text, or slash-escaped glyph names, or mixed. OpenType features will be applied after the text has been changed. Alternatively, you can set (and read) a list of GSLayer objects. These can be any of the layers of a glyph. OpenType features will be applied after the layers have been changed. Similar to the above, but this list contains the GSLayer objects after the OpenType features have been applied (see GSEditViewController.features). Read-only. Scale (zoom factor) of the Edit view. Useful for drawing activity in plugins. The scale changes with every zoom step of the Edit view. So if you want to draw objects (e.g. text, stroke thickness etc.) into the Edit view at a constant size relative to the UI (e.g. constant text size on screen), you need to calculate the object’s size relative to the scale factor. See example below. The visible area of the Edit view in screen pixel coordinates (view coordinates). The NSRect’s origin value describes the top-left corner (top-right for RTL, both at ascender height) of the combined glyphs’ bounding box (see bounds), which also serves as the origin of the view plane. The NSRect’s size value describes the width and height of the visible area. When using drawing methods such as the view-coordinate-relative method in the Reporter Plugin, use these coordinates. Bounding box of all glyphs in the Edit view in view coordinate values. Position of the active layer’s origin (0,0) relative to the origin of the view plane (see bounds), in view coordinates. Position of text cursor in text, starting with 0. Amount of selected glyphs in text, starting at cursor position (see above). Position of cursor in the layers list, starting with 0. List of OpenType features applied to text in Edit view. Instances to show in the Preview area. Values are 'live' for the preview of the current content of the Edit view, 'all' for interpolations of all instances of the current glyph, or individual GSInstance objects. Height of the preview panel in the Edit view in pixels. Needs to be set to 16 or higher for the preview panel to be visible at all. Will return 0 for a closed preview panel or the current size when visible. Height of the little toolbar at the very bottom of the window. Read-only. Save the view to a PDF file. rect – Optional. NSRect defining the view port. If omitted, GSEditViewController.viewPort will be used. Implementation of the GSGlyphInfo object. This contains valuable information from the glyph database. See GSGlyphsInfo for how to create these objects. Human-readable name of glyph (“nice name”). Production name of glyph. Will return a value only if production name differs from nice name, otherwise None. This glyph may be composed of the glyphs returned as a list of GSGlyphInfo objects. This glyph may be combined with these accents, returned as a list of glyph names. Anchors defined for this glyph, as a list of anchor names. Script of glyph, e.g: “latin”, “cyrillic”, “greek”. Index of glyph in database. Used for sorting in UI. Alternative name of glyph used for sorting in UI. Alternative name of glyph used for sorting in UI, when using ‘Keep Alternates Next to Base Glyph’ from Font Info. Alternative names for glyphs that are not used, but should be recognized (e.g., for conversion to nice names). Divides the curve using the De Casteljau’s algorithm. A list of points that represent two curves. (Q0, Q1, Q2, Q3, R1, R2, R3). Note that the “middle” point is only returned once. Opens a file chooser dialog. Opens a folder chooser dialog. Write a message to the Mac’s Console.app for debugging. Log an error message and write it to the Macro window’s output (in red). Curve node. Make sure that each curve node is preceded by two off-curve nodes. Quadratic curve node. Make sure that each curve node is preceded by at least one off-curve node. This is only used for TrueType hints. Indicates a triple hint group. There need to be exactly three horizontal TTStem hints with this setting to take effect. if a font is exported. This is called for every instance and notification.object() will contain the path to the final font file. if some thing changed in the edit view. Maybe the selection or the glyph data. is called if the mouse is moved. If you need to draw something, you need to call Glyphs.redraw() and also register to one of the drawing callbacks. The writing directions of the Edit View.